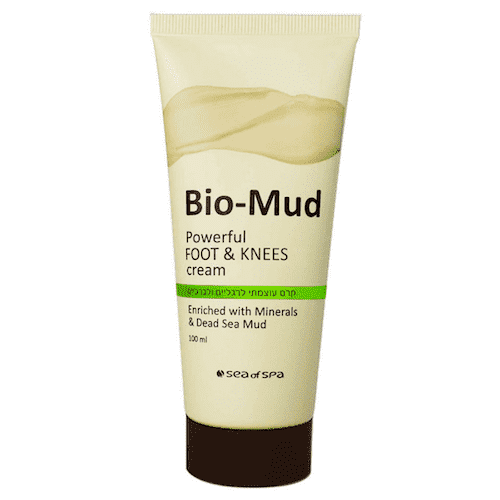 Rich, nourishing foot and knee cream enriched with Dead Sea mud and minerals. Contains moisturizing ingredients, minerals and Dunaliella algae, the cream is quickly absorbed to envelop your feet in a delightfully silky feeling. The cream is also rich in Vitamin E, Aloe Vera and Allantoin, instantly nourishing the skin with moisture that soothes and softens hardened, dry and cracked skin, leaving it feeling completely smooth and relaxed. Apply generously to the feet and legs, massage until fully absorbed. Water/Aqua, Glycerin, Cetearyl Alcohol & Ceteareth-33, Glyceryl Stearate, Propanediol, Simmondsia Chinesis (Jojoba) Seed Oil, Butyrospemum Parkii (Shea Butter), Stearyl Alcohol, Ethylhexyl Palmitate, Dimethicone, Aloe Barbadensis Leaf Juice, Phenoxyethanol & Ethylhexylglycerin, Glycerin & Sodium Lactate & Lactic Acid & TEA-Lactate & Serine & Urea & Sorbitol & Sodium Chloride & Allantoin, Cocos Nucifera (Coconut) Oil, Decyl Oleate, Sorbitan Tristearate, PEG-40 Stearate, Maris Limus (Dead Sea Mineral Silt), Xanthan Gum, Tocopheryl Acetate (Vitamin E), Zinc Oxide, Allantoin, Maris Sal (Dead Sea Mineral Water), BHT, Fragrance, Hydrogenated Polydecene & Dunaliella Salina Extract, Butylphenyl Methylpropional, Hexyl Cinnamal, Hydroxyisohexyl-3-Cyclohexene Carboxaldehyde, Linalool, CI: 14700, 47005.